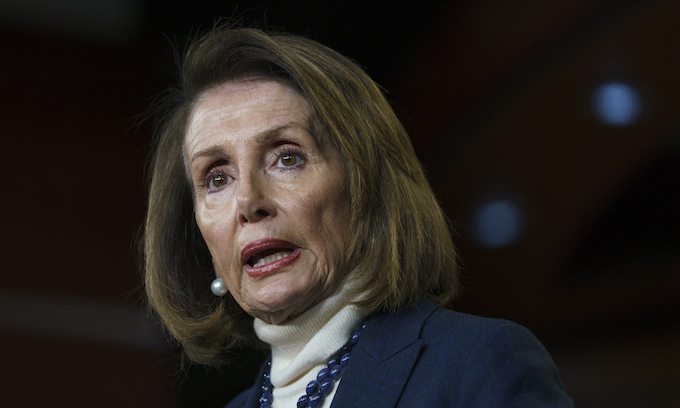 Speaker of the House Nancy Pelosi called Sunday for President Trump to take down a video he tweeted shaming Rep. Ilhan Omar over her controversial remarks about the Sept. 11, 2001, terror attacks, saying the tweet has put the freshman congresswoman’s life in danger. “The President’s words weigh a ton, and his hateful and inflammatory rhetoric creates real danger. President Trump must take down his disrespectful and dangerous video,” Mrs. Pelosi said in a statement Sunday. “Following the President’s tweet, I spoke with the Sergeant-at-Arms to ensure that Capitol Police are conducting a security assessment to safeguard Congresswoman Omar, her family and her staff. They will continue to monitor and address the threats she faces,” the California Democrat added. Trump responded with a new tweet this morning. A video of Rep. Omar’s speech, which was given at an event hosted by Council on American-Islamic Relations (CAIR) in March, was recently uploaded to the internet and sparked outrage, including among the lawmaker’s colleagues on Capitol Hill. Mr. Trump weighed in on Friday, tweeting “WE WILL NEVER FORGET” and shared the video Mrs. Pelosi says is dangerous. Ms. Omar has received at least one death threat. Earlier Sunday, White House press secretary Sarah Huckabee Sanders said it was a “good thing” the president was calling out Ms. Omar’s belittling comment. She noted Ms. Omar has had a history of controversial remarks, some of which have been characterized as anti-Semitic. The freshman Democrat has criticized pro-Israel lobbying groups. “It’s absolutely abhorrent the comments she continues to make and has made,” Mrs. Sanders said, questioning why Democrats haven’t spoken out against their colleague. Rep. Bennie Thompson, Mississippi Democrat, defended Ms. Omar, telling ABC News that the president was seizing on that moment and he didn’t see anything wrong with the speech. “There are other issues we have to deal with,” Mr. Thompson said Sunday. Defenders of Ms. Omar said she was trying to stress Muslims aren’t responsible for an act committed by extremists and shouldn’t face discrimination. In a tweet Friday, Ms. Omar suggested she’s being criticized because she is a Muslim. “Was Bush downplaying the terrorist attack? What if he was a Muslim,” Ms. Omar tweeted. this should leave no doubt who the real enemy within are. the democrap party is soooooo anti american that it makes me SICK. KARMALA HARRIS IS A FOOL! BARRY SOTERO SOWED MORE HATE SEEDS IN 8 YEARS THAN ANYONE HAS SINCE THE SIXTIES. the current democrap party needs to be defeated and dismantled then put it on the ash heep of history. The Traitorous, destructive Liberal Democrat Party revolves around and its philosophy is based on the lack of integrity, Lies, Cons and Deceptions and is unethical, corrupt and immoral. We see proof of this everyday by the insane hate displayed by the Liberal Democrat female congress Ms’s. The male hateful Liberal Democrats do not display as much hatred but it is there. The Liberal Democrats express vile hatred, then when President Donald Trump address such hatred by the Liberal Democrats, they accuse him of being hateful. But this is normal deceptive behavior for the vile, hateful Liberal Democrats. The best we can hope for, is that the rational citizens of this country, see the destructive, deceptions of the Liberal Democrats and vote them OUT of office everywhere. For me, i’ve NEVER ever had any doubt that the entire DNC has been the enemy within for DECADES! Islam is an ideology not a religion. It is dangerous and as anti-American as it gets. We as Americans and Christians have lost our way and are now paying the price. Do the letters F. O. mean anything to you. Pelosi is an idiot, and a communist. Lottoman, Let’s add A.D. (F.O.A.D.) to Pelosi and all the despicable America hating democrats!! If this woman’s life is in danger (and I hope it is not). It isn’t because of anything Trump has done or said. It is 100% because this woman has presented herself, over and over, as an enemy of The United States. It’s as simple as that. Her life SHOULD be in danger. Enemy spies, and traitors, should be executed, one way or another. She was the keynote speaker at an openly terrorist supporting organizations event. She has openly supported terrorists herself. Her eternal demise can’t come soon enough. At least one death threat? So she got one death threat. What about Maxine Waters telling people to commit violence against Trump supporters? What about that? That’s OK? Big woop. I bet a lot of congressmen get death threats. They’re not death threats…They are just something that some people did! Or CBS even airing a piece on TV, expressly calling for liberals to “PUNCH A NAZI” (meaning any conservative)?? Hey, Nancy, get you little disgusting, rude and anti-sametic Muslum congress woman to quite with all her hate speech and may things will get better. Omhar is a problem for herself and you. Nancy and the Dems are soft on terrorism and Muslim encroachment in the world. 99% of the world’s terrorism is tied to this military/political/false religious system. America cannot afford to let it gain a foothold here to launch further terrorists attacks and divide the country. I predict that Muslim refugees brought here under Obama may have to be deported back to their home countries. ITS already got a foot hold. OTHERWISE Omar and the other witch, wouldn’t be in congress. Pelosi’s city, San Francisco, is in shambles. Druggies have taken over. She needs to resign from Congress as an absolute failure. With how in shambles MOST (if not all) libtard held cities are, THEY SHOULD all resign! If the democrats don’t like hearing what omar says when actually put out there next to what she was talking about then get her to shut her racist anti-Semitic mouth. But they would rather defend her hateful excuses and lies than set her straight concerning what really happened. The democrats are a sorry excuse for americans. And to top it off the dems are playing right into the hands of president Trump with their defense of these American hating democrat congressmen. America is seeing them for the lowlifes they are. I wonder, HOW that will resolve itself, come next year’s vote though? WILL enough people be so turned off the Dems that they lose not just their bid for the White house, but MORE than enough seats in congress, to give us a super-majority? Pelosi talking about someone else’s hateful rhetoric is an absolute joke. This woman is one of the most hateful, and hated members of Congress. A real hypocrite! And Talib is running a close second! Worried that her life is in danger? When she has committed political suicide? It’s normal in m uslim people to do their deed and then blame others, if she did that in her own country she wasn’t alive . It is common tactic in communists to shout imaginary threats that doesn’t exists, and this is what happening in here, m uslims using the communist party to cause a civil war which is their ultimate goal in this country, I heard a mu slims said it 12 years ago and they are working on it. Once the communist-democrat party is not of use to them anymore they will eliminate them. That is how they work. Anyway a Hurra for P. Trump for that video and as we all know was the normal answer to a verbal attack to our country, and those critics they and their party are selling-betraying our country, very like Judas in the Jesus story we are studying this week. The Trump-hating, delusional Democrats led by Speaker Pelosi are scrambling to defend Representative Ilhan Omar’s highly offensive and purposely vague characterization of the horrific 9-11 attack and its resulting 3,000 deaths as nothing more than “some people doing something”. Instead of standing up for these innocent victims and their families, the Democrats have chosen to portray Islamist Representative Omar as the real victim and to vilify anyone who has the decency to criticize her disgusting comment. The democrats who defend Ihlan Omar’s disgusting anti American vitriol either share her sentiment or are just too caught up in their hatred of our president to care that a subversive anti Semitic radical Islamist is sitting in our government. Keep in mind, as millions sat quietly and said nothing and to the joy of people like Ms. Omar, the Nazis exterminated six million Jews. This teaches us that in times of crisis, silence is acceptance and to the rest of congress who thinks they can avoid taking a side by remaining silent, their silence is equally as shameful as the democrats who support this hate monger. It is likewise unconscionable that not a single congressman has had the guts to put forth a resolution calling for the expulsion of this mongrel from congress under article 1 section 5 of the constitution. Whether such a resolution would get the necessary two thirds vote needed to pass doesn’t matter. What matters is that it would force every congress man and woman to vote and then we would know exactly where they stand. Excellent suggestion. Democrats spew their hatred of Trump and Americans who support him and then claim victimhood when their attacks are questioned. They don’t just hate the President. THEY DESPISE our country and our constitution.. IMO. Hmmm. Why are the Covington kids coming to mind??? Funny she doesn’t mention the violence being incited against Trump or his followers. Of course not. SHE things that violence is ‘justified’. Those who don’t learn from the past, are doomed to repeat it. Why do you have to practically get naked to get through security at airports these days (unless you’re wearing a Burqa)? Oh that’s right, it’s because of 9/11. It it obvious to every patriotic American citizen that Omar is NOT a patriotic American. She isn’t the slightest bit interested in America. She ran for office to further her Muslim ideals. Make no mistake … Islam is NOT a church as we define it. Islam is a political ideal committed to it’s own success in running the world! Look at the actions of Islam throughout history. It has continually been on a quest to destroy everything and everyone NOT Islamic/Muslim, people, religions, AND governments. Wherever they go they leave destruction behind! Even if it were a religion, history has shown … PROVEN, that no church should be allowed to attempt to run a government, NO CHURCH AND NO GOVERNMENT. The difference between a religion, and a cult is what happens to you if you try to leave. That a bunch of left wing Demo wannabees jump to support Omar is further confirmation of the anti-American destructive bent that the whole party is engaged in. The so-called Democratic party of today bears no resemblance to the Democratic party my grandfather (1853-1922) supported. The deterioration began with Wilson and FDR and continues at an accelerated pace. I was raised with the idea that respect is earned not demanded from others. Sorry Nancy and your minions, you have done nothing to earn respect. If anything, you have done MORE THAN ENOUGH to earn all the disrespect and scorn we can GIVE YOU! I believe that everything Piglosy says is hateful, and inflammatory, and she should shut up, and resign. Pelosi wants to silence the Truth in Trump’s tweets. The liars resent any facts contradicting their evil propaganda just like cockroaches hate the light revealing them on the kitchen floor. Deport Islamist Rep. Omar (D-MN) back to Somalia and Senile Speaker of the US House Pelosi (D-CA) back to the Peoples Republic of San Francisco CA!